The world is increasingly weaving a diplomatic web in which nations find themselves haplessly and unwittingly insnared. One such web in recent years has been the buttressing of long standing alliances by the incorporation of new members. Examples of these organizations are the European Union and NATO as well as fragile and tenuous military coalitions. Additionally, the world has witnessed the re-emergence of a bygone world superpower, Russia. We watch as she flexes her atrophied political muscles while she surreptitiously annexes the former now sovereign territories. Perhaps most insidious is the appearance of rouge political-military organizations like ISIS which has precipitated negotiations between ideologically disparate nations. 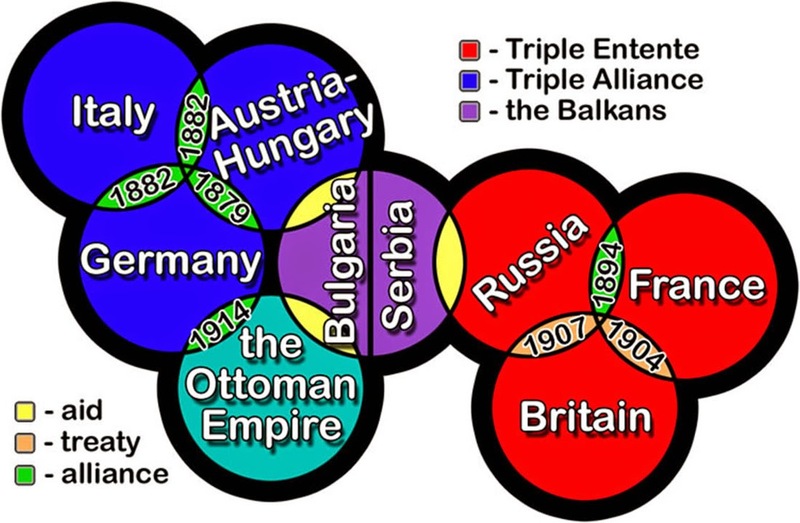 This layered overlap of alliances, which muddied any clear, workable partnership, is essentially what sparked WW1 back in the summer of 1914. Unceremoniously we marked the centennial this year and the world seems to be asleep at the wheel as a similar landscape of uncertainty unfolds. Pope Francis warned of just such a scenario as he laid a wreath at the foot of a monument in Italy commemorates soldiers who died during the First World War. Then as now the geopolitical landscape seems to be astride a powder keg as the world attempts to keep the emerging flash points at a distance. Lessons should have been learned from the First World War as the world again 100 years later stands on the precipice of a protracted and seemingly unending military engagement. Here follows two priorities which should to be addressed in order to keep the geopolitical community from the mistakes a century ago. One: NATO needs to redefine its mandate. The organization has become so convoluted and antithetical in regards to its original charter. Not only are there landlocked nations which are member states but most of the NATO members are not even bordering the Atlantic Ocean. When the Soviet Union collapsed so to did the Warsaw Pact nations along with their collective military alliance. To fill the void of uncertainty, the Western democracies expanded their membership ranks to include these developing or emerging Eastern European democracies. Delving farther back in history, this tactic was employed by the Roman Empire in order to pacify an uncertain unity which was forged between Rome and the peoples just beyond the Empire's border. Two: The western nations should reconsider their role in brokering temporary peace between historically hostile governments. Utilizing a venn diagram technique to do a risk-benefit analysis on the effectiveness of loose alliances will not solve systemic problems. It's often an arduous task to sift through the hallow rhetoric of politicians. Yet, when they pepper their speeches with phrases like “protecting our (western) interests” , it usually means cheap natural resources or cheap labor. Rethinking and retooling our involvement in centuries old ideological debates along with rethinking and retooling our dependence on the protection of cheap natural resources and cheap labor, is where we should be investing our diplomatic energies.